Parsley, Sage, Rosemary and Thyme was their third album, released on Oct. 10, 1966. To think that Simon and Garfunkel broke up not once, but twice, in the beginning of their career, is frightening. This duo is proof that there is such a thing as musical soul mates. Paul Simon’s poetic lyrics have listeners connecting their lives to his words, song after song, while his and Art Garfunkel’s voices keeps their ears blissfully entertained. It’s almost uncanny how well their voices complement each other. Simon and Garfunkel’s musical journey together began at a young age. The pair met when they performed in the same sixth grade production of Alice in Wonderland, Simon as The White Rabbit and Garfunkel as The Cheshire Cat. Only two years after meeting, the two 13-year-olds spent countless nights in the Simon basement duplicating the sounds of their favorite artists on Garfunkel’s tape recorders. The Everly Brothers were their main inspiration at the time. Their first performance was at a 1955 school assembly at Forest Hills High School. They decided to perform under the name Tom and Jerry because they found it to be more marketable than Simon and Garfunkel. As their friendship grew stronger so did their musical connection. Simon took up the guitar sometime after that first performance and the songwriting came alone with it. In 1957, they released their first professional recording for Sid Prosen of Big Records. Their track, “Hey, Schoolgirl,” would be what jumpstarted their career. Backed with “Dancin’ Wild,” their single was released on 45 rpm and 78 rpm records and reached #49 on the Billboard charts with 100,000 copies sold. Although there was initial success, the duo did not manage to put out any more hits as Tom and Jerry and eventually, Big Records label folded. Simon and Garfunkel carried on finally with their real names but decided to pursue college after their high school stint with fame. They each went to separate colleges in New York but somehow managed to find one another again in 1963. Both men realized they still had the same desire to create music and also found that the folk scene in New York City interested them. Simon shared with Garfunkel what he had been working on and how folk music had inspired it. The three songs he showed him were to be three of the five original songs written by Simon that would be later included on their first album, Wednesday Morning, 3 A.M. That album was initially a dud when released in 1964. Their first breakup would follow this and the duo would get back together almost a year after that when their single, “Sound of Silence” was receiving positive reviews. On January 17, 1966, Simon and Garfunkel released their second album, Sounds of Silence, which had some rerecorded tracks from Simon’s solo album, The Paul Simon Songbook. With the help of the album title, their second album was welcomed warmly by fans. They hit #21 on the charts and the rerelease of their first album was #30. Only nine months later, they would release their album that would polish the folk rock sound they established in Sounds of Silence. At a short running time of only 29 minutes, the Parsley Sage, Rosemary and Thyme record speaks volumes. 1966 was an extraordinary year for rock music. Obviously, there were great album releases prior to this time, but in 1966, things started changing. This was a year where artists were releasing completely original music, lyrically and musically. Simon wrote all of the songs except for the last track which samples Josef Mohr and Franz Gruber’s “Silent Night” and a replicated “7 o’clock news” report of the actual events of August 3, 1966. 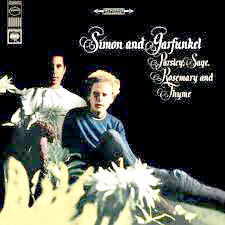 The record opens with the popular track, “Scarborough Fair.” This song was almost like the remains of Simon’s time in England during their first breakup. It is an adaptation of an old English folk song that they also combined with Simon’s The Side of a Hill antiwar track from The Paul Simon Songbook. Numerous amounts of vocal overdubs are used in the opening track, along with the harpsichord as one of the instruments. The outcome of the mix is perfect. “Patterns” tells of the patterns of life and how we become trapped in them. “Cloudy” and “The 59th Street Bridge Song (Feelin’ Groovy)” are two tracks simply written about the little things in life. They ooze joy. “Homeward Bound” has been judged as pretentious by many but it tells the story of Simon longing to return home to his girlfriend and to his home in the United States. It is said that Simon wrote the song during a long wait at a train station after playing a show in Widnes. The concluding tracks on the album are quite the wrap up. “A Poem On the Underground Wall” is accompanied by a buoyant acoustic guitar and a distinct, gloomy sounding organ in the back. “7 O’clock News / Silent Night” is a strong closing statement. “Silent Night” is paired with an artistic statement on the state of the U.S. at that time. Garfunkel plays the piano throughout the song. While Sounds of Silence was a great success, Parsley Sage, Rosemary and Thyme was an excellent follow-up. The record was ranked 201 on Rolling Stone magazine’s 500 greatest albums of all time.